Now, mind you, this is just from a once-a-week teacher. He will get a similar volume of stuff from his regular class, his speech class, his cub scout pack, and probably some holiday-thing the town runs. Not to mention whatever the wife and I and his grandparents are likely to put in an Easter basket. Not to mention my not-yet-5-year-old daughter will get just as much from as many sources. Oh, and did I mention we recently discarded two full shopping bags of candy and doodads accumulated by both kids from Halloween through to Valentine's. And, of course, that's not figuring in any candy they actually ate or toys they cared enough about to take out of the baskets we kept dumping this stuff into. Folks, that's just too much crap. Seriously. We have to put a stop to this. I understand how it is. Kids love to get little gifts, and there's an enormous variety of cheap merchandise available from the ubiquitous dollar stores--or directly, by the gross, from OrientalTrading.com. Costs diddly, makes a room of kindergartners momentarily happy, and it can be hard to resist that. 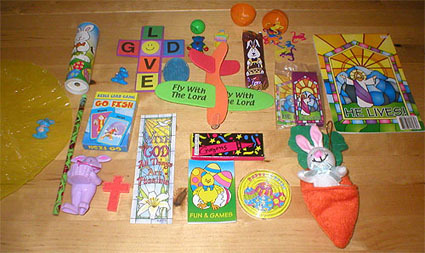 I'm sure my son's CCD teacher took joy in putting these gift bags together. I don't begrudge her that. I just ask that she--you, me, all of us--think this through a bit first. Environmentally, it's wasteful. The plastic resin of small toys isn't typically recyclable. Domestically, it's unwanted. Ask any parent and they'll all say they don't need any more junk kicking around the house. Philosophically, it's overkill. One little gift is a pleasure; a bushel of them is irrelevant. Educationally, it's troubling. We're teaching our kids to be voracious consumers of disposable objects. There's nothing wrong with wanting to see a child's face light up, but we've got to control that urge for the larger picture. Give them a small sweet or two, not a sandwich baggie packed to the seams, for every dinky holiday. Maybe a small booklet or stickers or, perhaps, a little toy that actually has some play value (i.e., won't fall apart after one use, as will anything purchased from OrientalTrading.com). Try to come up with something that's simple but unique, inexpensive but not cheap, personal yet appropriate for a range of kids. Yes, I know that's difficult. Doing that might actually require some thought, some creativity, some willingness to put more effort into the process than just plunking down money. I know we're all busy people, but I honestly believe it's worth the trouble. I love giving and getting--love seeing my children give and get--cute, small gifts. We all do. To keep that experience special, we need to stem the tide of disposable junk we exchange compulsively in lieu of actual sentiment. As for the big bag-o'-stuff from the Sunday school teacher, here's what I say she SHOULD have given: the chocolate marshmallow bunny and the "He Lives" coloring book. That's it. A secular sweet, and some Christian doctrine. Seem about right as an Easter token from a religion teacher? Damn straight it does.